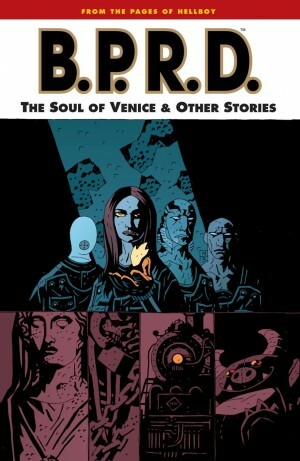 The sixth collection of Mike Mignola’s Hellboy series collects two separate but connected stories. In ‘The Third Wish’, which begins immediately after the end of Conqueror Worm, Hellboy follows an impulse that takes him away from all his familiar haunts and to an un-named country somewhere in Africa. Naturally, it doesn’t matter where he goes, he is always recognisable and in some way linked to the beings of that place. Mohlomi (a real figure from South African history, chief of the Basuto), an enigmatic magical personage who seems to dwell between worlds, gives Hellboy some advice and directs him into the ocean where he dives deep underwater. 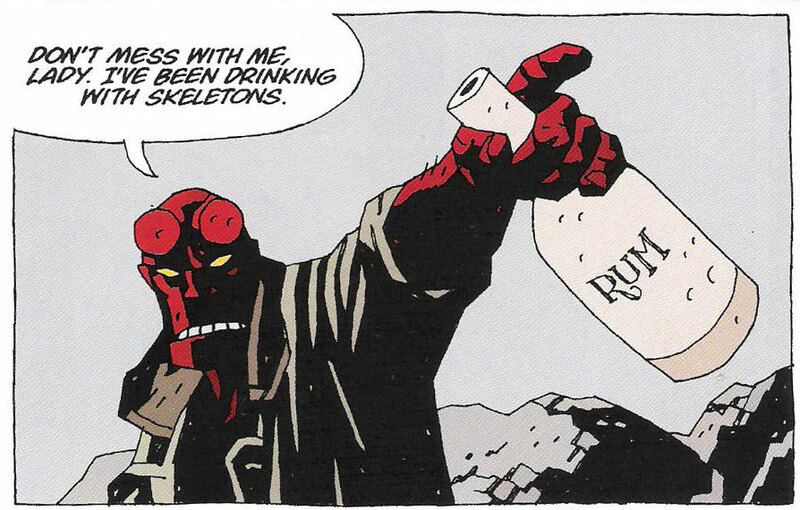 Pretty much every supernatural creature Hellboy meets either wants to have a drink with him or destroy him immediately, and in the second category is the immortal sea monster, the Bog Roosh. Far beneath the waves, Hellboy is quite literally out of his element. The bones of a dead werewolf, three mermaid sisters and the souls of dead sailors are all that stand between him and a watery grave. 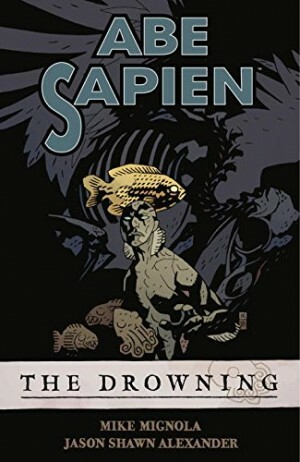 However, since there is a second story in this volume it’s no spoiler to say that he manages to survive this predicament and is eventually washed ashore onto ‘The Island’, a bleak and desolate pile of ruins where he is once again recognised (it’s hard to disguise that giant stone hand). There really is no escape from his destiny as “Anung Un Rama”, the bringer of the apocalypse. 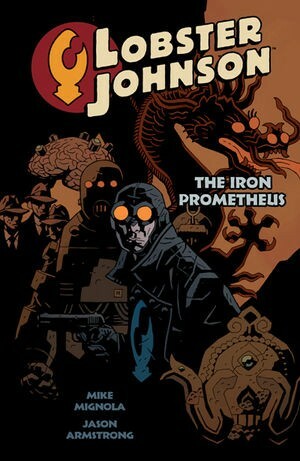 This all sounds like quite familiar territory, but with Mignola pushing his storytelling further and further into minimalism and pure design, creating large spaces of very carefully composed colour against varied amounts of black, and pacing that freezes the action, breaking up into patches of calm and then exploding into intricate action, it looks and feels like something very new. In style and execution it’s a lot more sophisticated and subtle than the work that introduced this character six volumes ago. 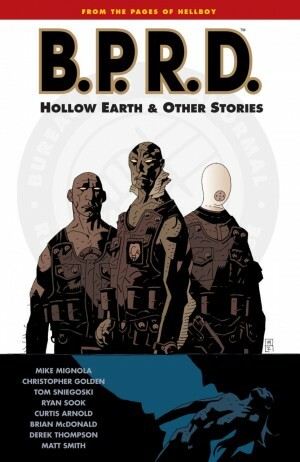 This is an essential collection for Hellboy fans with the most inventive approach to this material from Mignola thus far. In his story notes at the end of the book, he writes about the difficulties he had in making this second story work and there are not one but two different sections of unused and abandoned pages that are fascinating to see. This volume has an introduction by Gary Gianni, a new epilogue and as mentioned above, extras: an eight-page unused opening for ‘The Island’ and a second alternative opening of that story in pencil, plus some sketches. 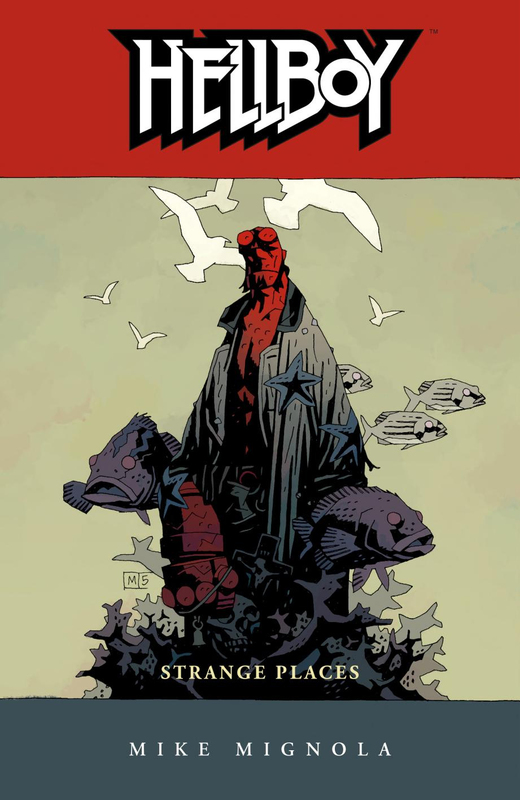 This book and the previous volume five, Hellboy: Conqueror Worm is also reprinted at a much larger size in the archival hardcover Hellboy Library Edition: Volume Three.